Back-to back bleaching events have given the Reef little chance to recover. CANBERRA -- The Climate Council has accused the Turnbull Government of putting the already "terminal" Great Barrier Reef in grave danger by pressing ahead with plans for a $16 billion coal project in Queensland. Two days after reporting that the dying Reef had experienced a vast back-to-back coral bleaching event in 2016 and 2017, the Climate Council lambasted the Federal Government for having its priorities wrong and risking a "significant economic asset". The vast World Heritage Site off Queensland is, according to the Climate Council of Australia, a $1 billion slice of a $1 trillion global reef asset. And the Council, in releasing the report, 'Climate Change: A Deadly Threat to Coral Reefs' on Tuesday, is stating that Adani's proposed $16 billion Carmichael coal mine, port and rail project is putting the 2,300km-long ecosystem further at risk and it's urging tourism operators to speak out more about their concerns for their livelihoods and the reef's future. So it is the world's single largest marine structure versus Australia's largest coal project. The Indian mining giant is ready to start construction this year after being given preliminary approval by the Turnbull and Queensland Labor Governments, but there's concern the Galilee Basin project will create billions of tonnes of pollution, use billions of litres of groundwater and further damage a delicate and already struggling reef. The Deputy Prime Minster Barnaby Joyce believes the Basin will be turned into into a "cash cow" for Australia and directly employ about 3000 people, with a further 10,000 indirect jobs. "It's a great investment in getting people out of poverty," Joyce told ABC Radio on Tuesday. Adani has applied for a $900 million concessional loan from the government's Northern Australia infrastructure fund to help build a line connecting the central Queensland mine and the Abbot Point port. Climate Council report author and ecologist, Professor Lesley Hughes has told The Huffington Post Australia that any prioritising of mining over the reef's future does not make sense. "One of the problems is the short-termism verses long term thing," Professor Hughes told HuffPost Australia. "So in the short term, yes might employ more people in a coal mine," she said. "Long term, though possible less long term then we had hoped, we have this extraordinary natural icon that is a global asset as well as an Australian asset. "That's very much in danger from our propensity to keep digging up, selling and burning fossil fuels. "We are endangering having this asset into the future." 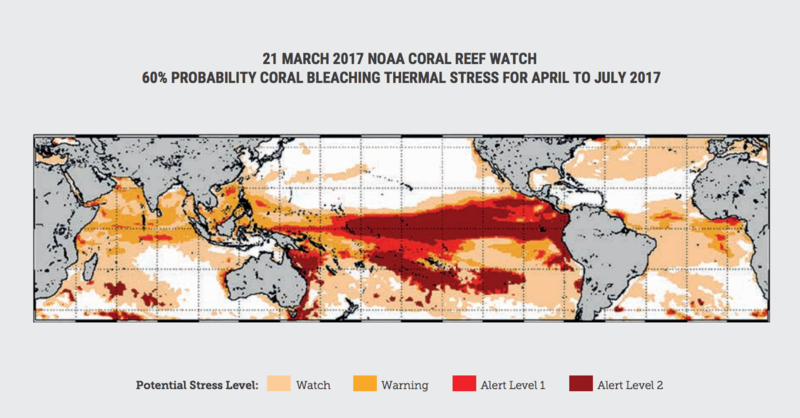 Climate Council: In Australia, there is potential for widespread bleaching and mortality along the entire length of the GBR. 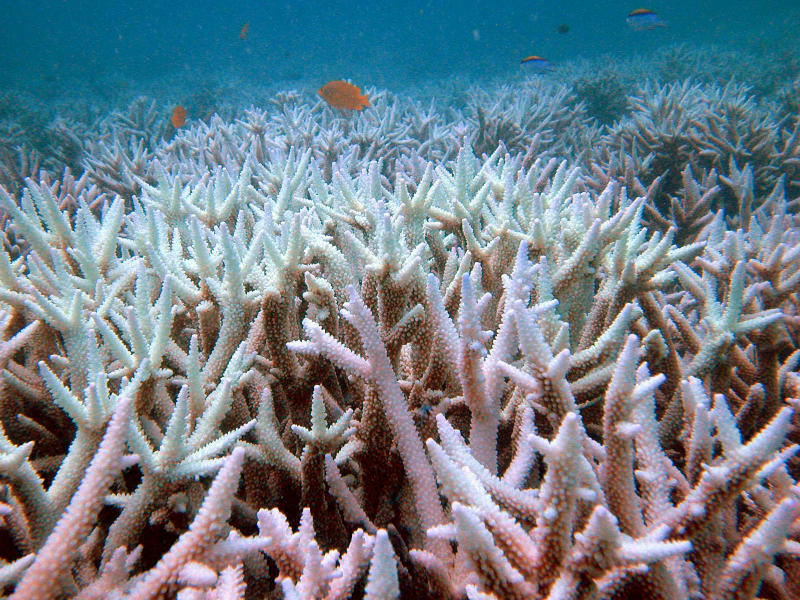 And there's an astronomical dollar figure on the potential global loss of coral reefs. The world's reefs are known to be, conservatively and collectively, worth $1 trillion and for the Great Barrier Reef alone, the Climate Council expects, if it dies off, Australia would lose more than 1 million visitors to the region annually – a figure equivalent to at least $1 billion in tourism spending and 10,000 jobs. During the 2016 election campaign, Prime Minister Malcolm Turnbull promised $1 billion in spending over five years to protect the reef and keep it off the World Heritage "in danger" list. 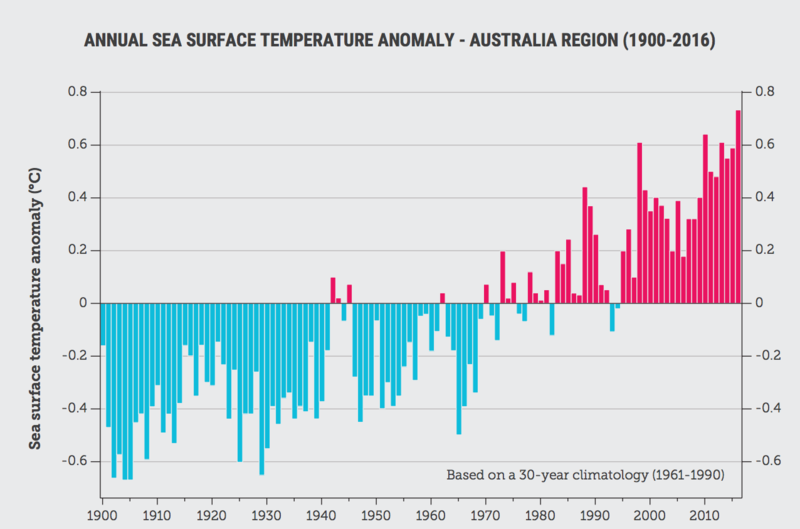 Long-term warming trend of ocean temperatures in the Australian region since 1900. Deloitte Access Economics found in 2013 that the Great Barrier Reef is worth up to $6 billion annually and employs around 70,000 Australians in sectors such as tourism and fisheries. It is likely is worth more now in 2017. "It is more than three times," Hughes said. "There's more than 20,000 jobs in coal in Queensland. 70,000 in the reef. "Economically, places like the Great Barrier Reef are worth far more in terms of jobs than coal mining. For the Climate Council, the evidence of damage is mounting. 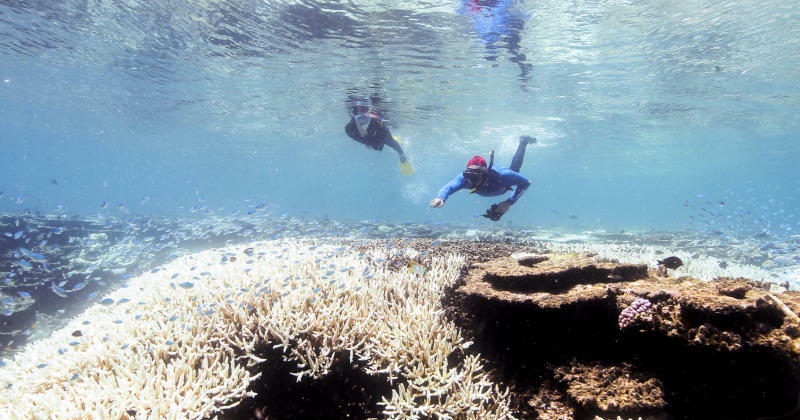 It cites recent findings from the U.S National Oceanic and Atmospheric Administration (NOAA) that the world has been undergoing, since 2014, the third and longest global coral-bleaching event on record as pools of very warm water move around the planet. Also, on Monday, Australian researchers from the ARC Centre of Excellence for Coral Reef Studies revealed aerial surveys showing, for the first time, back-to-back severe bleaching events across two-thirds of the vast Great Barrier Reef with expectations of high levels of coral death. The combined impact of bleaching two years in a row stretches for 1,500 km from the far north to Port Douglas in the reef's middle third, leaving only the southern third unscathed. The event has been so severe that a fifth of the coral which has been bleached appears to have died. The ARC Centre researchers, led by Professor Terry Hughes, insist this disastrous scenario had not been caused by El Niño, but say record-breaking temperatures driven by global warming were to blame. 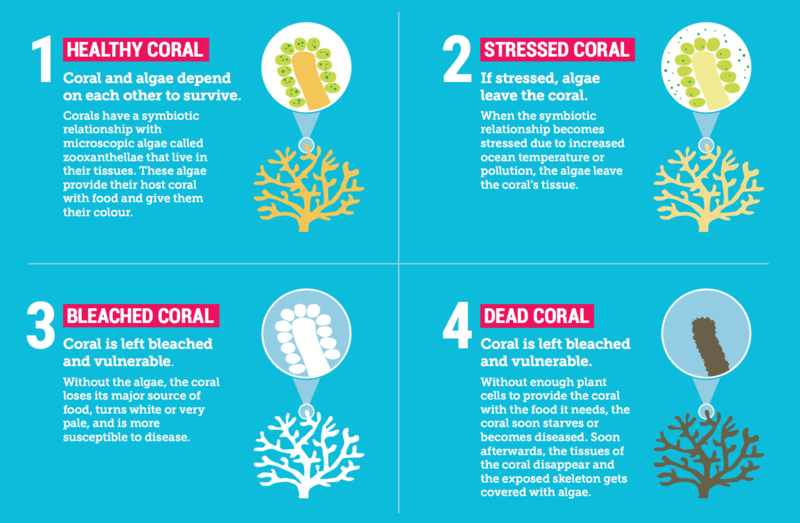 The Great Barrier Reef is not the only Australian reef suffering from coral bleaching. Northwest reefs near the Kimberley coast and Christmas Island as well as the Scott and the Seringapatam Reefs have all experienced severe bleaching in 2016. The Climate Council's Lesley Hughes told HuffPost Australia that the latest findings of the aerial surveys are "very, very concerning." She said it is clear the world's oceans are warming. "We've had overall about a degree of warming since pre-industrial times," she said. "The important thing for coral reefs is that 90 per cent of that extra heat is being absorbed by the oceans." "That ocean being a heat sink means that the impacts of climate change are being felt first and foremost by those highly sensitive marine systems like coral reefs." The repeated events from 2016-to-2017 mean the corals are being tested like never before. "It is very, very sad," Hughes told HuffPost Australia. "Reefs can bounce back but they need a period of several years, if not decades with no further stressful events in order to do so." "They are, by their nature, fairly slow growing things. "The problem is as bleaching events occur, both increasing in severity and closer together, the chance of bouncing back is much diminished." The bounce back is predicted to get more difficult. Climate Council: The devastating 2016 GBR bleaching was at least 175 times more likely due to climate change. The ARC Centre of Excellence for Climate System Science, reported in 2016, that by about 2030, extreme ocean temperature could lead to a severe bleaching event every year or two. That scenario would mean "no time at all in between events to recover", according to Hughes. There was hope that cooler waters as a result of last month's Cyclone Debbie may give some reprieve for the Great Barrier Reef. But it appears not to have turned out. "Most of the cyclone damage hit below where most of the bleaching was," Leslie Hughes said. "So you are getting damage from Cyclone Debbie but it appears to not be cooling down the reef north of Port Douglas where most of the bleaching is occurring." "So no real good news there." Environmentalists are involved in a big, long fight against Adani's Carmichael coal mine project in the Galilee Basin, west of Rockhampton. Anyone or anything remotely associated with it has been targeted, like banks and other investors. The Climate Council wants tourism operators to speak up about the reef. "There are a lot of tourism operators who are very, very fearful of their livelihoods, quite logically," Professor Hughes said. "Many don't really want to talk about bleaching because they are afraid, quite understandably, that people won't come." "But what we are trying to say to them is you need to be a voice to government. To say you need to have better climate policy. You need to look at whether Adani should go ahead, because this is our long term livelihood." "It is sort of beyond their control, but we at the Climate Council would certainly like to see more of them be a voice for better climate policy because their businesses and livelihoods are absolutely on the frontline on climate change."